Alp Horoz prepares a backhand stroke. The junior helped lock down Sunday’s doubleheader, winning both of his singles matches. History is happening in Evanston. Following up a tough loss to a top-3 team to start Spring Break, Northwestern continued its dominance by going perfect in conference play. The No. 13 Wildcats (17-2, 3-0 Big Ten) won three times over the break, sweeping both Indiana (4-12, 0-3) and IUPUI (6-17, 1-0 The Summit) 4-0 at home along with defeating Purdue (12-5,1-2) 4-2. But the team couldn’t fend off No. 3 TCU (15-2), losing in a close 4-3 battle. TCU snapped NU’s 11-match winning streak last week. This match was rescheduled from Feb. 24, when the Horned Frogs were unable to make the trip to Evanston due to inclement weather. NU went into the TCU match looking to win its second-straight match against a top-10 team. Earlier in the month, freshman Ben Vandixhorn rallied from a set down to clinch the team’s 4-3 victory over then-No.8 Illinois, marking the program’s first ever victory against a top-10 team. 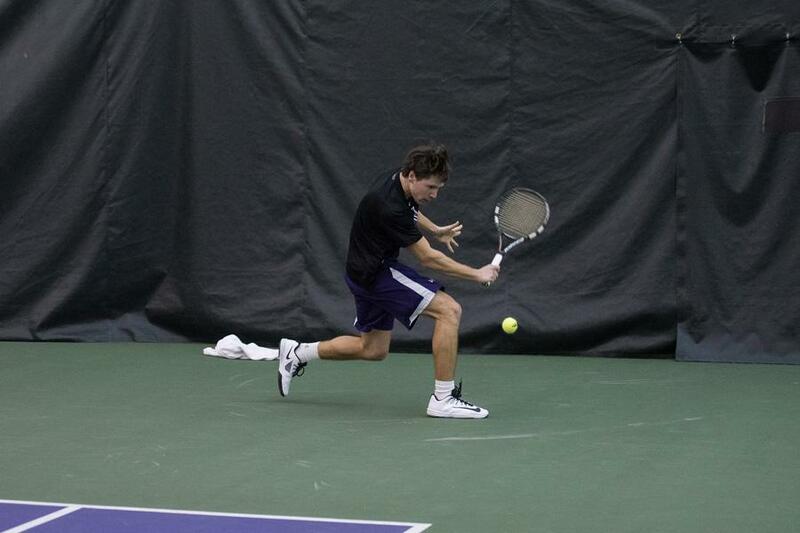 Against TCU, NU fell behind 3-0, and was on the brink of dropping the match. However, the Cats rallied, winning the next three singles matches, including wins from junior Konrad Zieba and senior Fedor Baev who had to rebound after losing the first set. Vandixhorn rallied from a set down while the match set tied at 3-3. But this time he came up short. He lost lost the third set by a score of 6-2 to Trevor Johnson. The team then traveled to Purdue on Friday and got back on track with a 4-2 win over the Boilermakers. Antithetical to the team’s previous matchups, NU cruised to the doubles point with a pair of 6-1 victories at No. 1 and No. 3 doubles. No. 42 junior Sam Shropshire’s dominating 6-3, 6-1 win at second singles over No. 57 Benjamin Ugarte highlighted the match. Junior Strong Kirchheimer secured the fourth and clinching point with a 6-3, 4-6, 6-1 victory at third singles. On Sunday, the Cats returned home to play a doubleheader against Indiana and IUPUI. They improved to 3-0 in Big Ten play with their 4-0 sweep of Indiana. The match was NU’s first match played outdoors at the Vandy Christie Tennis Center this season. The nightcap against IUPUI which the Cats also won by a score of 4-0 was not nearly as competitive as the match against Indiana. NU did not lose any singles sets and won most of its matches without much drama. The Cats will return to the court and look to stay undefeated in Big Ten play on Friday at home against Wisconsin.